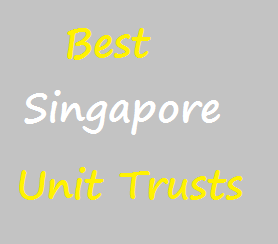 The 10 best Singapore unit trusts for 2014 & 2015 are Aberdeen Singapore Equity, Infinity US 500 Stock Index, First State Bridge, LionGlobal Singapore Balanced, etc. Unit trusts, also known as mutual funds around the world, can provide an attractive investment vehicle for investors or households. They are well diversified investment and may provide less risk than individual stocks. You can also invest around the world including Singapore. They provide investment in equity, fixed income, and balanced fund. 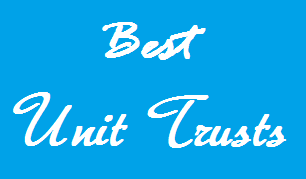 These best unit trusts are selected based on its management fee, performance, risk, expense ratio, etc. This list provides diversified selection of unit trusts including equity, fixed income, balanced, short term bond, money market, etc. 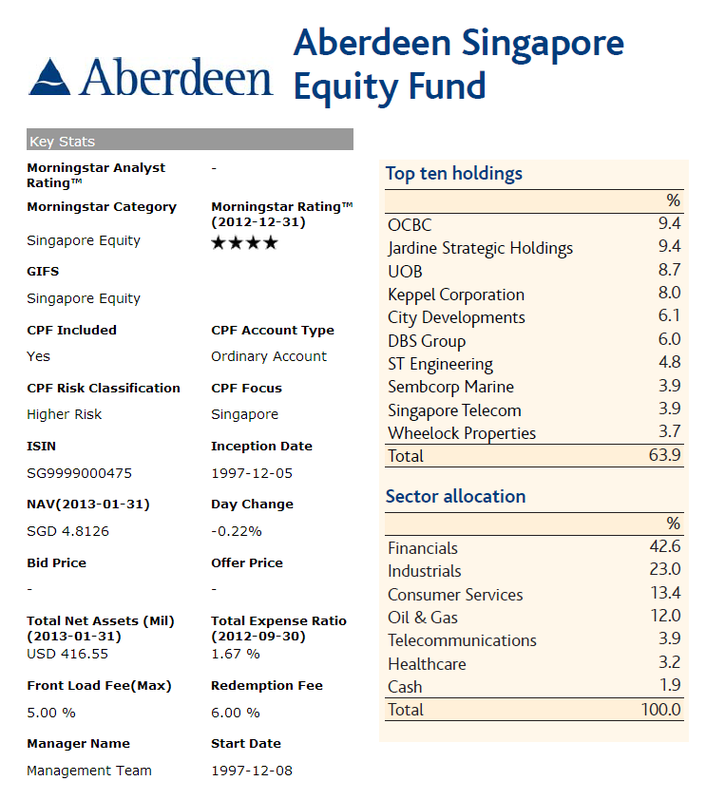 Aberdeen Singapore Equity Fund objective is to provide holders with medium to long-term capital growth from a portfolio of Singapore equities. This best Singapore mutual fund has 4-stars rating from Morningstar. The fund is incepted in December 1997. The total net assets are USD 416.55 million. It also has 1.67% of total expense ratio. The YTD return of this fund is 2.69%. It has 19.59% 1-year return and 12.68% 10-year annualized return. FTSE/SGX STI TR SGD is the fund’s benchmark. The management fee is 1.5% p.a. There is a minimum initial investment of S$1,000 or US$ 5,000. The top holdings of this fund as of December 2012 are OCBC (9.4%), Jardine Strategic Holdings (9.4%), UOB (8.7%), Keppel Corporation (8.0%) and City Developments (6.1%). The top sector allocation is Financials (42.6%) and Industrials (23.0%). Aberdeen Global Opportunities Fund utilizes its assets to purchase equities or equity-related securities around the world. This Aberdeen fund has USD$ 167.64 million total net assets as of January 2013. It has 4-stars rating from Morningstar. The total expense ratio is 1.73%. The fund’s has 3-year annualized return of 2.05%. It currently has YTD return of 5.73%. The 10-years annualized return is 5.94% and it is on the 1st rank in Morningstar category. The top country allocations as of December 2012 are United States (22.5%), United Kingdom (16.5%) and Switzerland (12.4%). The top holdings are TSMC (4.0%), Roche Holdings (3.9%), Johnson & Johnson (3.3%), Vodafone Group (3.3%) and British American Tobacco (3.2%). 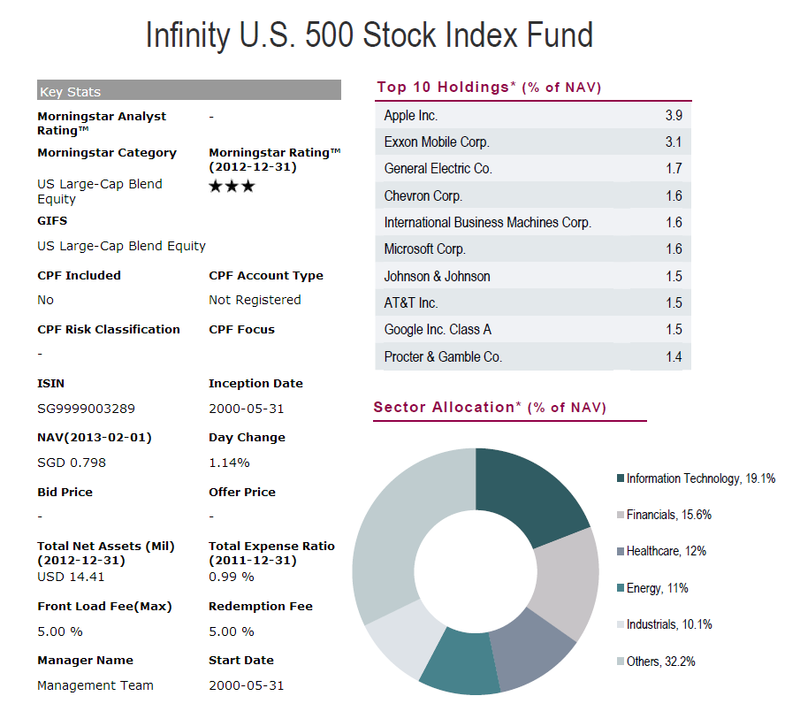 This Infinity U.S. 500 Stock Index Fund aims for medium to long-term capital appreciation by following the performance of the US stock market. It invests as a feeder fund in the Vanguard U.S. 500 Stock Index Fund. The Vanguard® U.S. 500 Stock Index Fund employs a "passive management"—or indexing—investment strategy designed to track the performance of the Standard & Poor’s (”S&P”) 500 Index. This S&P 500 Index is a widely recognised benchmark of U.S. stock market performance that is dominated by the stocks of large U.S. companies. An index fund such as this Fund has operating expenses, and, therefore, while expected to follow its target index as closely as possible, will not be able to match the performance exactly. Morningstar investors rank this fund with 3-stars rating. The inception date of this fund is May 2000. It is currently managed by Gina Chan. It has total net assets of USD 14.41 million. The total expense ratio is 0.99%. The fund’s benchmark is S&P 500 TR. It has YTD return of 7.69%. The fund has returned 14.00% over the past 1-year and 4.14% over the past 3-year. The highest annual return within these past 8 years was in 2009 with 21.03%. As of January 2013, the top holdings of this fund are Apple Inc (3.9%), Exxon Mobil Corp (3.1%), General Electric Co (1.7%), Chevron Corp (1.6%), International Business Machines Corp (1.6%) and Microsoft Corp (1.6%). The top sector allocations are Information Technology (19.1%, Financials (15.6%) and Healthcare (12%). This Sub-Fund aims to maximize income and long-term total return by investing primarily in listed closed-ended Real Estate Investment Trusts and securities of property-related companies, which are incorporated, listed in or have their area of primary activity in the Asia Pacific Region. The Sub-Fund may also invest in depository receipts including ADRs and GDRs, debt securities convertible into common shares, preference shares and warrants. This top Singapore fund has 4-stars rating from Morningstar even though it has just been incepted in 2007. The fund’s total expense ratio is 2.19%. The total net assets are small in amount with only USD 11.97 million. The current fund manage is Pearly Yap. The fund recorded a total return of 39.23% in 2012, which is the best annual return since its inception. The worst total return was in 2008 with -52.48%. The current YTD return is 6.22%. The fund benchmark is MSCI AC Asia Pacific REIT Index. The top holdings as of January 2013 are Lend Lease Group (6.9%), Cheung Kong Holdings (5.9%), Sino Land (4.7%), Capitaretail China REIT (4.6%) and Capitaland (4.6%). The top country allocations are Singapore (30.5%), Australia (27.5%) and Hong Kong (14.4%). 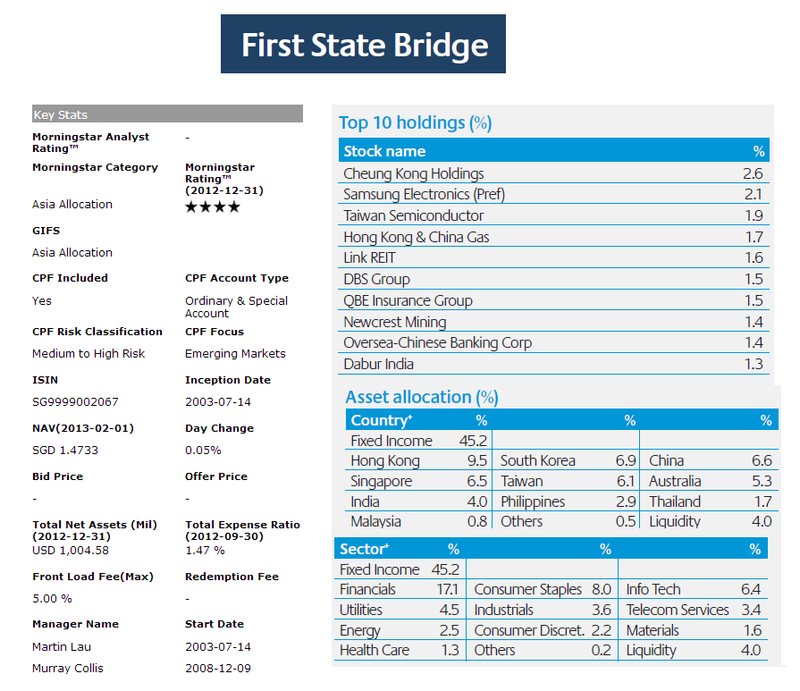 First State Bridge fund focuses its investment in the Asia-Pacific ex Japan region by investing all or substantially all of its assets in the Dublin domiciled First State Asian Equity Plus Fund and First State Asian Quality Bond Fund. The First State Bridge fund has the highest total net assets among the funds mentioned in this article with USD 1,004.58 million. It has 4-stars rating from Morningstar as well. The total expense ratio is 1.47%. This fund is currently managed by Martin Lau and Murray Collis. The YTD return of this fund is 1.66%. The fund has returned 12.83% over the past 1-year. The 5-year annualized return is 3.05%. The top holdings as of January 2013 are Cheung Kong Holdings (2.6%), Samsung Electronics (2.1%), Taiwan Semiconductor (1.9%), Hong Kong & China Gas (1.7%) and Link REIT (1.6%). The top country allocations are Hong Kong (9.5%), South Korea (6.9%), China (6.6%) and Singapore (6.5%). The LionGlobal Singapore Balanced fund invests most of assets in equities listed or quoted on the Singapore Exchange Securities Trading Limited (“SGX-ST”) and bonds in Singapore. It may invest in Hong Kong SAR, China, Thailand, Malaysia, Indonesia, Philippines, Japan, India, Korea, Taiwan and other countries outside Singapore. The current fund manager of this fund is Kelvin Wong. The fund has total net assets of USD 96.68 million. Morningstar rated this fund, which has been incepted since 1995, with 4-stars rating as well. The total expense ratio is 1.45%. This LionGlobal fund has 1-year trailing return of 7.97%. It also has YTD return of 2.24%. The top holdings of this fund are DBS Group Holdings Ltd (5.8%), United Overseas bank Ltd (5.1%), Singapore Telecommunications Ltd (4.4%), Oversea-Chinese Banking Corp (4.3%) and Keppel Corp Ltd (3.7%). The top sector allocation is Financial (43.4%).